CombiBar Gold (50 gram) and Silver (100 gram – 100×1 & 10×10) divisible bullion bars from Valcambi Suisse are gaining in popularity as more and more advisors (and, yes, some quacks) call for pretty much TEOTWAWKI (The End Of The World As We Know It). Unfortunately, they could be RIGHT! The Valcambi Gold CombiBar and sibling Silver CombiBar can be a nice hedge against disaster by allowing you to carry real money (gold & silver) in your wallet in denominations appropriate for daily purchases and trade. If you don’t want to carry that much in your wallet, perhaps have a few Gold CombiBars and a small stack of Silver CombiBars stored in the hidden home safe. Gold CombiBars are divisible to 1 gram “squares” (really a rectangle) and Silver CombiBars divisible to 1 gram or 10 gram “squares”. All are appropriately stamped so that all parties involved know what they are dealing with. A 50 gram Gold CombiBar is 1.6075 ounces of Gold (50 divided by 31.1034768 grams per ounce) and by extension, a 100 gram Silver CombiBar would be 3.215 ounces of Silver. How Does The CombiBar Work? Both the Gold CombiBar 50 gram product and the Silver CombiBar 100 gram (10×10 grid or 100×1 grid) are rectangular mint type products designed to be thin enough to carry in a wallet with a “scored” grid such that a 1 gram (Gold or Silver) or 10 gram Silver piece can be easily and accurately removed for payments. Each grid “square” is engraved in much the same way as a mint bullion bar with either “Gold” or “Silver”, fineness, and amount (1g or 10g). In order to derive the value of a gram of Gold or Silver, simply divide the current price per troy ounce of the appropriate precious metal by 31.1034768 (OK, maybe 31.1035 would be close enough?). 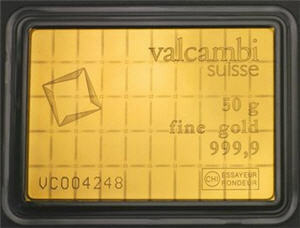 With Gold at $1350 per ounce, 1 gram of Gold from a Valcambi Gold CombiBar would be worth about US$43.40. Perhaps too much for a sandwich but maybe about right for a family meal or some groceries. 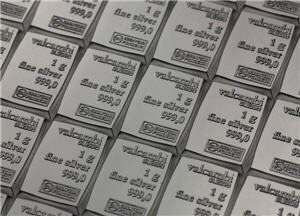 If you want a smaller method of payment, 1 gram of Silver from a Valcambi Silver CombiBar would be worth almost 75 cents with Silver at $23 per ounce. Since that may be a bit too small in a crisis situation (can you hear “crisis situation” in an Arnold Schwarzenegger accent – can’t remember which movie) then go for the 10×10 grid Silver CombiBar where each 10 gram mini Silver bar would be worth about US$7.40. Maybe that would pay for a sandwich. Depending on how you look at it, carrying a 50 gram Gold Combibar in your wallet, as the price of Gold goes up, could be good or bad. It’s good if you are trying to carry a large sum of real money on you. It’s bad if it bothers you to have US$2500 in your wallet, or at $2000 per ounce, around $3215. It IS a CombiBar and you could break off however much you want to carry at one time and leave the rest at home. Platinum CombiBars and Palladium CombiBars are minted, but personally we don’t see too much use for them. It will be hard enough in North America to get people to understand the value of Gold and Silver as payment forms in times of crisis let alone Platinum and Palladium. Also, PGM’s (Platinum Group Metals) have never really been considered “money” by hard money experts since their use is primarily industrial. And, finally, they may be hard to find! Ed D’Agostino of Hard Assets Alliance just prepared a short, special video on the Gold CombiBar. Ed has a dedicated page to the CombiBar here. Where Can I Buy A Valcambi 50g CombiBar in Gold or 100g Silver CombiBar? Just recently one of our favorite Buy And Store Gold vendors, Hard Assets Alliance, announced that the 50g Gold CombiBar was available for storage or delivery (see post here). None of the coin dealers we deal with carry the CombiBar 50g Gold or 100g Silver. When we first saw the Gold CombiBar debut we were blown away by the innovation. Adding Silver, especially with the 2 size grid options available for the Silver CombiBar was both logical and appreciated. We try not to be too doom & gloom around here; hopefully we learned something from the whole Y2K thing. But we decided to do a Valcambi CombiBar review from the standpoint that it’s not out of line for a prudent person who wants to be prepared to have a few of these within reach; you never know. With the global crisis grinding on into the unknown with out of control money printing by most every major government we truly are in uncharted waters. Thankfully the premium over spot Gold or typical sovereign coins is not that excessive as to make this a difficult purchase like, say, 24 karat Gold chains that DO carry a high fabrication (and profit) premium. If nothing else, Start by taking a look around eBay… nothing is more fair than an auction, right? What do you think? 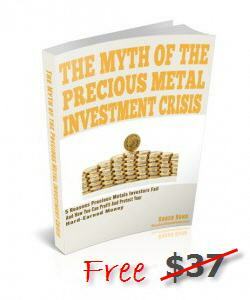 Is a CombiBar (Gold or Silver) in your future? Which one? Leave us a comment, please!